Saturday morning Brittney helped me with the botched haircut I had received earlier in the week. It took forever and suddenly our morning was gone, but at least my hair looked better. She and I went out for a taquito and a quick shopping trip. Then she packed up her stuff and went to Alice to meet up with her Dad and Melissa for the rest of the weekend. 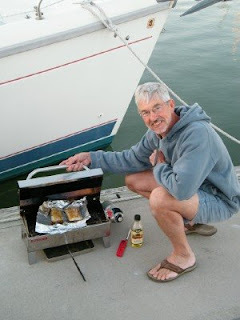 Bruce cooked some wonderful Mahi Mahi we picked up on the way out to the boat. He loves his little grill. It has really got the workout this week. After dinner, we took a walk around the marina. It was a beautiful evening. 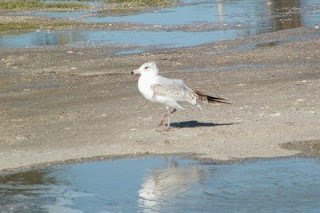 Everywhere we looked the birds were pairing off. 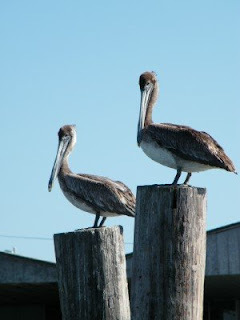 We love the Brown Pelicans. 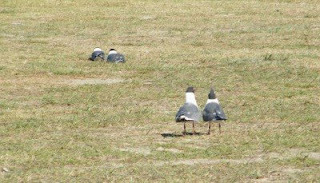 The seagulls were two by two all over the park. It's fun to watch their ritual. They are very loud! These two are taking a comunal bath. 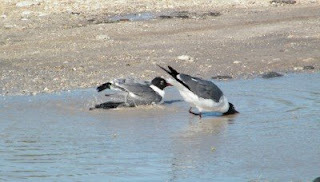 We stopped to watch as they flapped and flopped water over themselves. I felt kind of bad for this guy. I think maybe he's not so attactive... he's all alone here and doesn't seem to get it. We finished our walk along the ship channel. 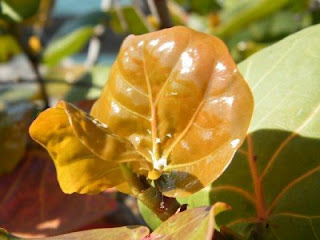 I love to see the new spring growth everywhere. As my staycation draws to a close... Spring begins at last!